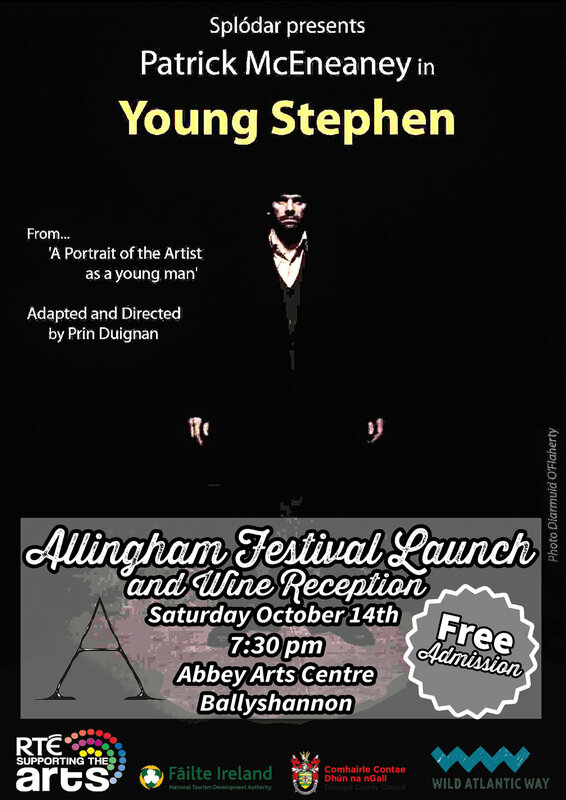 Join us for the Allingham Festival programme launch with 'Young Stephen', a dramatic adaptation of Joyce's 'A Portrait of the Artist as a Young Man', starring Patrick McEneaney, in the Abbey Arts Centre on October 14th, with wine reception at 7.30pm. 'Young Stephen' examines the early life of Stephen Dedalus from Joyce’s semiautobiographical novel. Stephen’s young and idyllic life is turned around as he spends his first term at boarding school. We follow Stephen from isolation and loneliness to a new sense of freedom. On his return home he finds a household torn down the middle due to the political turmoil caused by the fallout from the revelation of Charles Stewart Parnell’s affair with Kitty O’Shea. McEneaney’s highly energetic performance expertly weaves through the characters and stories of young Stephen’s formative years. Also on the night, Allingham Festival Committee chairperson Tom Sigafoos will present a preview of the Allingham Festival 2017. Abbey Arts Centre - October 14th - Free Admission - Wine Reception - 7.30pm.